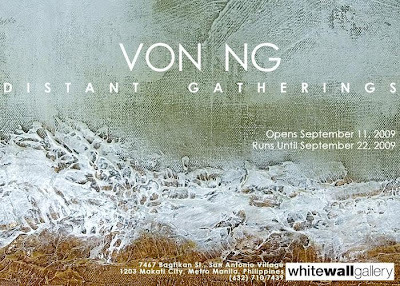 For the most part, the abstracts of Von Ng wanders a sublime theater of emotion, suggestive of those purest, most elusive, and yet inexplicably nostalgic scenes of life, which somehow seem to exist only in dreams and other fictions. Consciously departing from the ugly and distraught images that seem to define the world and much of fashionable art about it today, Ng’s work is informed by unapologetically archetypal notions about beauty, elegance and grandeur in art. He frequently alludes to the romance inherent in, say, heroic endings and moments of enlightenment, or, conversely, the dark allure of foreshadowed disasters and epic tragedies. Having grown up in the Philippines and Canada, Ng’s early paintings were visibly influenced by his cultural duality, translating into a distinctive aesthetic that was neither Eastern nor Western, but rather a constant, if uneasy balancing act between both. Each piece was laden with competing inclinations, including attempts at incorporating abstracted Chinese and Japanese calligraphy with distinctively Western art techniques and even typically Western inspirations. With his more recent works, the artist captures a subtler, if more mature and effortless dialogue between his varied influences and identities, focusing instead on the single, cohesive sum of emotion, energy, and movement as found in the pause of a moment or in the abbreviations of memory. Ng’s abstracts demonstrate a more refined play of organic color fields and composition that are characteristically emotional and evocative, and often flirt with the representational. He plays with the idea of pure perception in abstract art, putting forth strong suggestions, say, of misty mountains at the top of a long climb or intangibly golden sunsets at the end of a long journey, and yet never truly allowing image to materialize into concrete, distinguishable form. In “Distant Gatherings,” his fifth solo show to date, Ng distances himself from the dramatic, emotional intensities of his previous works. While past creations were an immersion in busy, vigorous compositions, which work to absorb and engulf the viewer in their potency and verve, his latest pieces instead command a quiet, contemplative distance and reserve. Unique to these newer pieces are the concentrations of textural waveforms on an organic horizon line, contrasting with the spaciousness of large, almost solid color fields—easily the most immediate aspect of his work—which are interrupted only with the subtlest plays of tonality and transparency. Here, the artist offers a different perspective of the beautiful, furious, chaotic energy that always has been, and perhaps always will be, at the center of his work, revealing instead a kind of power that does not overwhelm but quietly compels, that is not forceful but intimate and impossibly seductive.